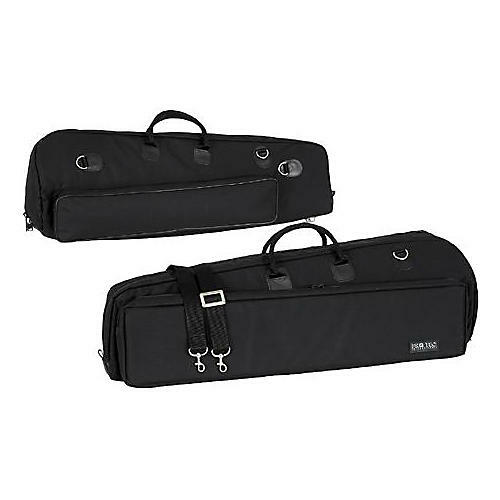 The Pro Tec C245 Deluxe Bass Trombone Gig Bag features a rugged ballistic nylon exterior, black powder coated hardware, roomy exterior pocket with a built-in organizer, thick 25mm padding, and a convenient shoulder strap. The C-245 gig bag accommodates bass trombone bells up to 10.25-inches and has an exterior pocket for the handslide. The Pro Tec C245 Deluxe Bass Trombone Gig Bag is available in black only. Click or call now to get the best deal anyplace...guaranteed!